What is Alaya? Many times we ask questions of others, expecting them to shed some light for us on various principles and teachings of Theosophy, whereas in fact we could discover the answers just as satisfactorily – if not moreso – for ourselves, through careful and meditative study. “Alaya” is a Sanskrit term which appears in “The Secret Doctrine” and “The Voice of the Silence” predominantly. We should understand that Alaya is a term and concept which originates with the Yogacharya School (now often written as “Yogācāra”) of Buddhist philosophy. The “Yogacharya School” literally means “Yoga Practice School” but this refers to a high and truly philosophical form of mental and spiritual yoga, not any kind of bodily or physical yoga practices. The Yogacharya school began in India and is part of Mahayana Buddhism. In the Buddhism of Tibet, where the Yogacharya teaching gained its strongest and most enduring ground, the two main philosophical viewpoints present in the various schools and branches of Buddhism are the Yogacharya and the Prasangika-Madhyamika. The two are quite antithetical, since the Madhyamikas seem almost obsessed with the theme of emptiness and insist that the ultimate nature of everything is emptiness, that there is nothing beyond emptiness, and that even this emptiness is empty of emptiness itself! The Prasangika-Madhyamika philosophy is the prevailing and predominant one in Tibetan Buddhism today, with the Yogacharya perspective now relegated to a back seat or, at best, insipidly blended with certain forms of Prasangika-Madhyamika. Ironically, the Gelugpas – the “Yellow Hats” to whom the Dalai Lama and Panchen Lama belong and with whom HPB and the Masters have specifically identified themselves – hold exclusively in their publicly known teachings to the Prasangika-Madhyamika. It must be the case then that there is a definite and almost entirely unknown esoteric undercurrent amongst the Gelugpas. For more information in this regard, please see the articles titled The Great Tsong Kha-pa and Self and Non-Self in Buddhism and Theosophy. Most exoteric and generally accepted historical sources trace the Yogacharyas back to Aryasanga (often just referred to as Asanga) and his half-brother Vasubandhu, saying that they lived and founded this school or system of philosophy sometime around the 5th century A.D., i.e. around 1,000 years after the time of Buddha. Some of Aryasanga’s writings were attributed to the Bodhisattva Maitreya – the next Buddha – as they were said to have been dictated by him during Aryasanga’s journeys into higher levels of consciousness. Some of today’s scholars and researchers believe that Maitreya was actually Aryasanga’s face to face teacher on the physical plane, with some of them identifying him with a mysterious individual known as Maitreyanatha (literally “Lord Maitreya”) about whom next to nothing is known except that he was said to come from the Kingdom of Shamballa. There are some contemporary writers who believe that this Maitreya was the real founder of the Yogacharya School. She provides, however, interesting and important information about Aryasanga and the Yogacharya School which is not to be found elsewhere. The entry in the “Theosophical Glossary” for “Maitreya” reads virtually identically to that for “Aryasangha” since we read that “The fact is that Maitreya was a follower of Buddha, a well-known Arhat … and that he was the founder of an esoteric philosophical school.” Perhaps we are thus to assume that Aryasanga and Maitreya were actually one and the same person? We can speculate but speculation rarely leads to definite knowledge. Since there is at no present no historical evidence available to support or confirm the above details and assertions, they are dismissed by scholars and historians as untrue. They like to think, of course, that no-one could possibly know more than they do or have access to information and records which are closed and inaccessible for the general public. Thus while such people will view HPB’s words as mistaken or fantastical, students of Theosophy will recognise that what she said was based on KNOWLEDGE; both her own and that of the Masters. For although it is never specifically stated outright, there are many hints and much evidence scattered throughout the Theosophical literature – and especially in the “Theosophical Glossary” – to indicate that the Masters, Adepts, and Initiates of the Trans-Himalayan Brotherhood belong to the secret and esoteric Yogacharya School of pure Buddhism. Alaya-vijnana (pronounced “Vinyana”) is variously translated as “Storehouse Consciousness,” “Causal Consciousness,” “Base Consciousness,” and called “Mula-vijnana” meaning “Root Consciousness.” Western “experts” on the Yogacharya system all seem to differ somewhat in their understanding of it but it seems to be implied that all Karmic seeds are stored in an individual’s Alaya-vijnana and that in this sense it becomes the cause of continued reincarnation, until enlightenment is reached. Students of the Advaita Vedanta philosophy of Hinduism may see some parallels between this and their doctrine of the Causal Body, called Karana Sharira in Sanskrit. Her deeply esoteric article “Psychic and Noetic Action” speaks of the Reincarnating Ego, the Higher Manas, in the human being, and says that “the Higher Mind-Entity – the permanent and the immortal – is of the divine homogeneous essence of “Alaya-Akasha,” or Mahat.” Mahat, literally meaning “The Great,” is a Hindu term for the Universal Mind and it is taught in Theosophy that every human mind is a ray of that Divine Universal Mind and of the same intrinsic essence as It. 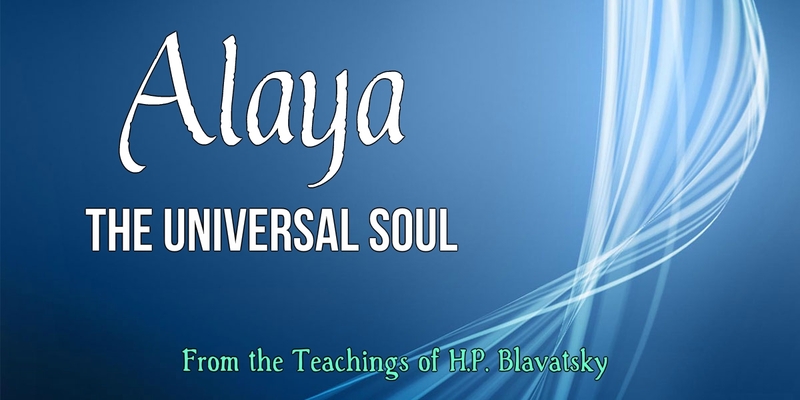 As the Universal Soul, Alaya is the Universal Consciousness, “the basis or root of all things,” “the basis of every visible and invisible thing,” “eternal and immutable in its essence” and yet reflecting itself “in every object of the Universe.” But the Universal Soul is not the same as the ONE Supreme Absolute Reality. The Absolute is that Paramartha in which “the Alaya of the Universe” lies latent during the unimaginably lengthy period of Universal Pralaya. Alaya is the Universal Logos. It radiates forth from the Absoluteness of Paramartha (regardless of whether we refer to It as Paramartha, Adi-Buddhi, Adi-Budha, Brahman, Parabrahm, Ain-Soph, or anything else) at the dawn of each Maha-Manvantara and proceeds to become the Living Universe itself. The Universal Soul, the Universal Logos, is the Universal Life. It will be seen that the Masters use the term “Avalokiteshvara” (which they define esoterically as “Self-Existent Lordliness” as opposed to the general exoteric interpretation of the word as “The Lord who Sees”) in exactly the same way and as a synonym for Alaya. As the Rig Veda scripture of Hinduism famously declares, “Truth is ONE, though the Sages call it by many names.” However, although there is only One Truth, this does not mean that everything is Truth. The concept of the Logos, like so many other things, has been seriously distorted and twisted beyond all recognition in the pseudo-Theosophy of the likes of Alice Bailey, C.W. Leadbeater, and Annie Besant. We would request that any of our readers whose “knowledge” is derived from the books of those “teachers” read our article Understanding the Logos so as to avoid seriously misunderstanding the contents of this present article. The “Venerable Chohan-Lama … than whom no one in Tibet is more deeply versed in the science of esoteric and exoteric Buddhism” once wrote part of an article for HPB, which was published under the title of “Tibetan Teachings.” Judging from the description given of him, as well as the tone and phraseology of his writing, it would seem that this individual was the same as the Maha Chohan, the venerable Master of the Masters and the Chief of the Trans-Himalayan Brotherhood, whose famous and important letter can be read by clicking here. Some very beautiful and inspirational things are said regarding Alaya in the book “The Voice of the Silence” translated by H.P. Blavatsky from the esoteric Buddhist text “The Book of the Golden Precepts” which she says is generally found in centres where Yogacharya schools are established, in Tibet and surrounding regions. * “Alas, alas, that all men should possess Alaya, be one with the great Soul, and that possessing it, Alaya should so little avail them! * “Thou hast to saturate thyself with pure Alaya, become as one with Nature’s Soul-Thought. At one with it thou art invincible; in separation, thou becomest the playground of Samvriti, origin of all the world’s delusions. * “Compassion is no attribute. It is the LAW of LAWS – eternal Harmony, Alaya’s SELF; a shoreless universal essence, the light of everlasting Right, and fitness of all things, the law of love eternal. “The more thou dost become at one with it, thy being melted in its BEING, the more thy Soul unites with that which IS, the more thou wilt become COMPASSION ABSOLUTE. As the original and genuine Aryasanga was “an Arhat, a direct disciple of Gautama the Buddha,” it stands to reason that the teachings of the “absolutely esoteric” Yogacharya School of “pure Buddhism” which he founded – of which we can safely assume that only a small portion is presented in the Theosophical teachings – are representative of the secret teachings of Buddha himself. Many Buddhists may and do deny this, yet HPB maintains that the members of this Trans-Himalayan Esoteric Brotherhood are “the “direct followers” of Gautama the Buddha” and quotes a prophecy which refers to them as “those who are to be denied by His Church for the next cycle” but only for the next cycle, since eventually the truth will be known to all. It seems that some Theosophists make the rather naive mistake of thinking that “Trans-Himalayan” is literally the actual name of the Masters’ esoteric School and Brotherhood. It is merely a geographical designation, for it is in the Trans-Himalayan region that the Esoteric Yogacharya School has its base and centre. May we saturate ourselves with pure Alaya, the bright and immaculate ray of the Universal Light within us, and allow it to reach to our very heart of hearts. THEOSOPHY AND THE THEOSOPHICAL MOVEMENT.